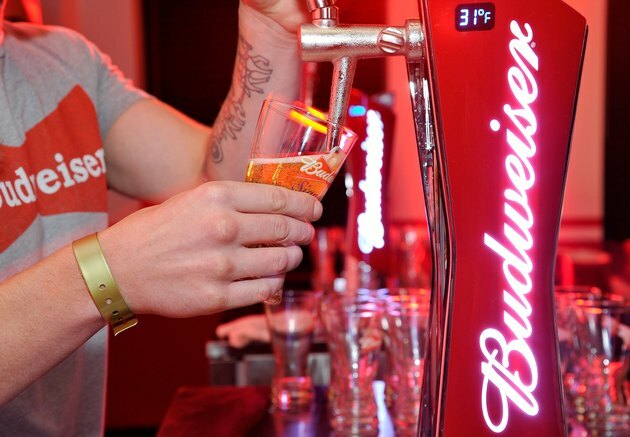 Budweiser, brewed by Anheuser-Busch, is one of the top-selling beers in the United States. Budweiser is brewed in multiple locations throughout the U.S. Budweiser is known for its beechwood chip aging system, providing its signature taste. Budweiser is composed of fermented rice, barley malt, hops, yeast and water. These ingredients normally provide vitamins and minerals that can help meet the body's daily requirements, though alcohol is not considered a nutritional food. Plant foods such as rice, barley and hops are high in vitamin E, C and B-complex. A 12-ounce bottle of Budwesier beer contains 145 calories. Active adults generally require between 1,800 and 2,200 calories a day, according to the National Strength and Conditioning Association. A 12-ounce bottle of Budweiser contains 10.6 g of carbohydrates and 1.3 g of protein. How Many Calories Are in Guinness Alcohol?